This is the "Color Selection Window" in BibleWorks7 available either through the menu under Tools or as a button on the toolbar. The Help manual (section 31) is just adequate on this topic, but there are two videos you should check in the Study Guides that come with BW7. 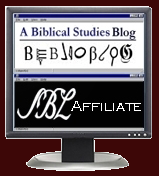 This BibleWorks Tips also showed how to work with the coloring tool as related to word frequency. Note that the version that appears in the top box (3) reflects the active display version. The bottom is the brother version. If you switch display versions, the boxes will switch. For my purposes, I wanted to highlight morphological features, which meant I was conducting my searches in the BGM, but what I really want to preserve is the coloring in the BGT. Before "applying" the coloring, be sure to create a new color file in the version you desire. Once you set a color scheme, you cannot change it. Be sure you have the colors you want before hitting "apply." The color selection window does stay open and can float on top or outside the main BW7 window. This is very helpful. If you choose two color codes that potentially conflict (e.g., you have all the words used 49 times or less highlighted--see this post--and then you turn on all nouns of which some may be in that 49 or less list), I am not able to predict which one will have priority. Here is a short video showing how to markup all the nouns in the genitive case in BW7 and save it to a file for later use. One of the nice things about the BW7 implementation of the coloring tool is that you can specify morphological features individually and turn them on/off individually. For example, you will see that I created a specific coding for nouns in the nominative case and also nominative pronouns. Since I specified verbs in various moods, I can highlight these nominative pro/nouns and the indicative and subjunctive verbs to quickly get an idea of subjects and verbs in a sentence. Another extremely useful feature of the coloring tool in BW7 is that it works in the Synopsis window as seen below. This is a great way to compare syntactical constructions. (A small bug: you need to select the morph codes you want activated before you open the Synopsis window.) It also works in the Parallel Versions window, but you would have to create color sets for each version. Does my color scheme make sense? Want to save yourself quite a bit of work? HERE is a ZIP file of all my color files I used. They work for BGT. 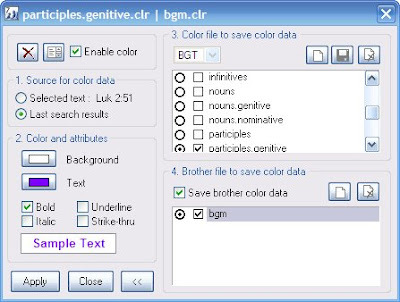 Unzip the files to your BibleWorks7 "database" directory, and when you open the Color Selection Window with BGT active, you should see them. Thanks so much for this. I have been struggling to understand the BW7 help on this, but your video made it all clear. You are welcome, Joel! Hmmm.... Hebrew. I'll try to get around to it someday, but I've got a lot of other stuff above it on my agenda! Maybe my examples with Greek will inspire you, and then you can share it here!